In recent surveys, The Joint Commission has scrutinized the entire endoscope management process. Everyone understands this is because of the serious patient safety concerns and media attention, as well as the manufacturers of scopes and reprocessors having their own product challenges. 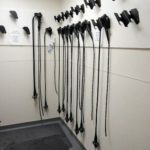 So why is The Joint Commission so hung up on how scopes are hung in storage? If you haven’t experienced a survey recently, here is what we are talking about: One of the areas of scrutiny is how flexible endoscopes are being hung, and do team members know how long they have been hanging? Surveyors want the scopes to hang freely without any bending or coiling. They don’t want them to touch the ground, nor do they want the scopes to touch each other in any way. The question then is why so much focus on hanging practices of scopes? The answer: because the best practice is to promote clean drying. As I learned in my college organic chemistry class: “Clean means dry!”. After scopes are removed from the reprocessors, even with the best drying technology (if you have it! ), there can still be droplets of liquid in, on and around the scope. Liquid is where “things can grow”. So the best practice is that scopes should hang completely freely – if they have any bend to it, the liquid can get stuck in the curve and facilitate the growth of bacteria. Yes, this even includes your extra tall, small bowel scopes! Hospitals are telling us that in their surveys over the past 6 months, The Joint Commission surveyors are not happy with these scopes having any bend, even if within the manufacturer guidelines! It’s a pain in the backside (I couldn’t resist) to meet these updated guidelines and recommendations. We all know that. The other side of that coin is that we all know patient safety comes first. Be prepared, and then work with your Joint Commission auditor to ensure you are providing the safest environment possible for your patients and your team. This is another step in that process for endoscope management. Are you prepared for your next Joint Commission visit? We can review your practices and help you prepare. Sign up for our free checklist to help ensure your organization is prepared for your next Joint Commission visit and don’t get caught with your pants down!